3 day / 4 night fishing & lodging package for 2 with a value of $5,990. 2 day / 3 night fishing & lodging package for 2 with a value of $4,150. Value of $2,000 to be applied as a credit towards a fishing & lodging package! Value of $1,000 to be applied as a credit towards a fishing & lodging package! Congratulations to the 4 lucky winners! We want to thank everyone for making this a successful fundraiser. Your support really does make a difference for the music students during this time of severe budget cuts. Again, a very sincere thank you to everyone who supported this fundraiser.  To see the raffle drawing videos, please visit our Facebook Page. Proceeds will benefit the Sitka High School Symphonic Band expenses for the 2019 school year. We thank you for your support of our daughters Karina and Kiana, who are both in Band classes. We see what a positive impact it has had, not only on their lives, but for all who are involved as well. All of the band students have benefited greatly in many ways from our previous fundraisers. Thank you for your continued support! We will do this again next Fall, so keep an eye out for the announcement. Buy YOUR Raffle Ticket(s) – $100 ea. A total of $13,140 in Prizes! Only 400 tickets for this raffle! We have another great opportunity for you to win one of four exciting prizes! For those of you wondering, we only have 400 tickets available for this raffle. (Proceeds benefit the Sitka High School Symphonic Band expenses for the 2019 school year.) We appreciate your support of our daughters Karina and Kiana, who are both in Band classes. We see what a positive impact it has had, not only on their lives, but for all who are involved as well. 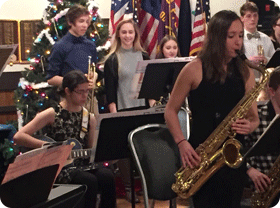 All of the band students have benefited greatly in many ways from our previous fundraisers. Thank you for your continued support! Alaska Premier Charters, Inc. has DONATED FOUR Prizes for this raffle fundraiser! 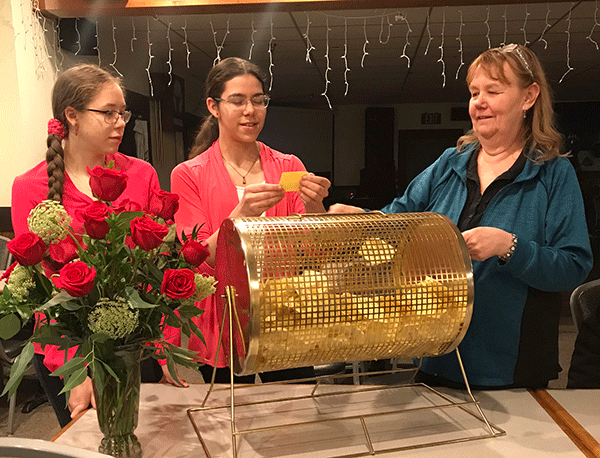 The winning tickets will be drawn on February 14th, 2019, at the Sitka Emblem Club #142 (Permit #0524). 1st Prize– A 3 day / 4 night fishing & lodging package for two people with a value of $5,990. 2nd Prize– A 2 day / 3 night fishing & lodging package for two people with a value of $4,150. 3rd Prize– Value of $2,000 to be applied as a credit towards a fishing & lodging package! 4th Prize– Value of $1,000 to be applied as a credit towards a fishing & lodging package! Tickets can be purchased with your credit card by calling Alaska Premier Charters, Inc. at 1-800-770-2628 or 907-747-3232. (No limit to the number of tickets purchased per person). Even if you have already purchased your fishing trip for 2019, you can still buy one or more raffle tickets and have a chance to be reimbursed for up to $5,990 (value of 1st prize) and applied to your booked fishing trip OR add more people to your party! Congratulations to the four raffle drawing winners of our Fundraiser for the Alaska Charter Association - Permit #3064. The drawing took place on September 3rd, 2018 at the Lodge. 2nd Prize: Mike Henry won a 2 Day/3 Night Fishing & Lodging Package for two persons with a $4,150 value! There are 500 raffle tickets for this raffle! We will continue to sell tickets throughout the summer fishing season. The winning tickets will be drawn on Labor Day - September 3rd, 2018, at the Wild Strawberry Lodge. You can buy raffle ticket(s) while you are here fishing this summer! 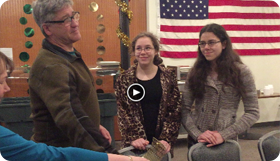 Congratulations to the three raffle drawing winners of our Fundraiser for the Sitka High School Symphonic Band! 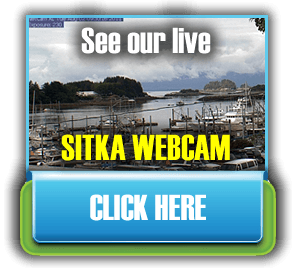 ( Permit #0524 thru Sitka Emblem Club). 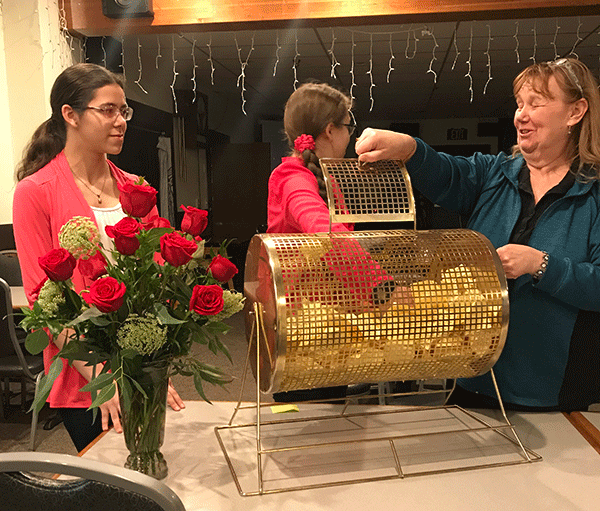 The drawing took place on December 30th, 2017 at the Elks Club. We want to thank everyone who bought raffle tickets for their support and we hope to see all of you this summer! Congratulations to the Winners! We hope we can do this again in the future. The December 1st, benefit raffle for a 3 day / 4 night fishing and lodging package to support Karina and the Sitka High School (SHS) Symphonic Band trip was a wonderful success. The lucky winner was ticket number 153, belonging to Mr. Hoang Tran. Congratulations Mr. Tran! This covers about 80% of a skipper’s vocabulary. The preparation is in full swing as the employees here at Wild Strawberry Lodge get ready for the season. We are enjoying the sunshine and getting lots of projects done as we anxiously wait for our guests to arrive. Once again, we are expecting big numbers of King Salmon! 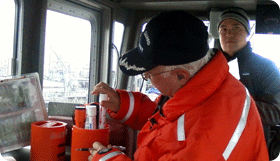 The good news is we will have the same 2014 regulations for catching King Salmon during this upcoming 2015 season! Best Limits on Kings in 20 Years! We are anxious for the 2014 fishing season to begin, to catch up with our friends who have been fishing with us for years and to make new friends, for first-timers to Alaska Premier Charters. While we always aim to please our clientele, this year is especially important for us, as we will expect big numbers with the King Salmon due to the most favorable regulations that we have seen in 20 years! The Wild Strawberry Lodge got a considerable facelift earlier this year. We are always trying to better the facilities and experience here at Alaska Premier Charters, Inc. Part of ramping up for the busy fishing season is to make sure that the guests have impeccable rooms to stay in during their visit. Over the past 23 years the success and reputation here has grown and we have looked to continue to ensure and even improve upon the overall experience. We look to provide the best comfort possible for your stay. For returning guests, we can assure you that you will be pleasantly surprised by the upgrades! As part of the team here at Alaska Premier Charters, one of my primary duties is showing guests the beautiful city of Sitka. There is great historical significance here as Sitka has the exact location where Alaska was purchased from Russia in 1867. 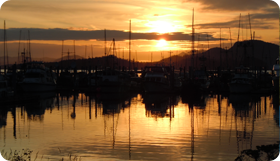 Sitka boasts twenty-four attractions listed on the National Register of Historic Places, seven of which are National Historic Landmarks. 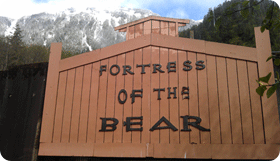 However, one of my favorite places so far is the Fortress of the Bear. 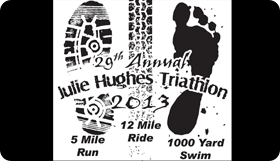 We just let our staff know there is a Julie Hughes Triathlon on Saturday May 18th at 8:30a.m. 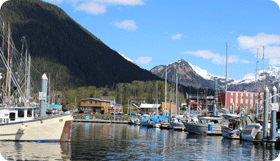 The Baranof Baracudas Swim Club is organizing Sitka’s annual Julie Hughes Triathlon. The triathlon will begin at Blatchley Middle School at 8:30 A.M. sharp. This challenge begins with a 5-mile run, followed by a 12-mile bike ride, and finished by a 1,000 meter swim. There will also be a short version of the course for participants 12 and under. The entry fee this year is $25 per person. Participants can enter as individuals or as teams. Clamming is always a fun adventure. So when it was time to get up at 6am, I was already wide awake and bushy-tailed. After a delicious breakfast I couldn’t finish, we decided it was time to round up all the gear necessary for our trip. Clam shovels, buckets, and of course life jackets were loaded. I knew dad wouldn’t forget to pack the lunch, but I had to double check to make sure we didn’t leave the donuts behind! I spied the box and peering inside I saw not only chocolate and sprinkle varieties, but maple bacon bars as well. Pleased with the contents of that box, I helped load the rest of the gear and we headed out. 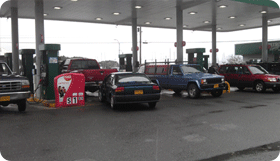 Yesterday lines were packed at the fuel pumps as the Sitka Fuel Dock hosted its grand opening. Petro Fuels wanted to give a little something back to the community while also promoting their brand new fuel dock. To celebrate the occasion they offered .25 cents off every gallon of gas which brought the price down to $4.10 per gallon of regular. This exclusive offer for a reduced price on fuel was available only at the Petro Express Station located at 614 Katlain Street. 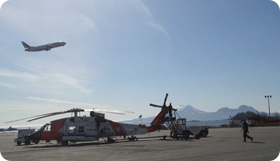 The Sitka Coast Guard hosted their annual open house day on May 5th this year. The public was encouraged to come check out their facilities and even participate in equipment demonstrations. As part of our own staff training at Alaska Premier Charters, Inc. we took a break from the daily grind and loaded up the employees. With safety precautions in mind, we feel it is important to have our staff prepared on what to expect and do in the event of an emergency both in preparation and after the arrival of the Coast Guard. Thinking about a fishing trip in Alaska is never too early, especially when there are so many considerations to do so. The length of the trip, lodging and meals, boat size, crew and experience, and many other things come into play when deciding where to go. Sitka has the highest unit of angler success per unit of effort for anywhere in SE Alaska! 40% of all the salmon and halibut sport caught in SE Alaska are landed out of this one port alone! Now that you are dialed into to Sitka as your Alaska fishing destination, the next question to ask yourself is what company I want to book my trip with? 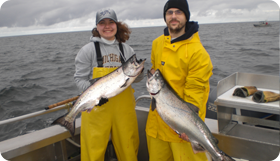 Alaska Premier Charters, Inc. and Wild Strawberry Lodge have been in business for over 23 years. 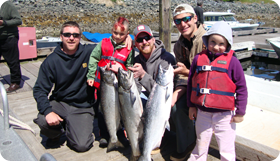 With this length of fishing lodge experience over the years, we make sure your saltwater fishing vacation is hassle free while you enjoy fishing for King Salmon, Halibut, Lingcod, Rockfish and Silver Salmon in scenic Sitka, Alaska. Living together in the staff house with many of the deckhands and crew of Alaska Premier Charters, Inc. and the Wild Strawberry Lodge, I’ve heard many tales that can only be told through a fisherman. Some are wild, some extreme, some blatantly fake, but they all start with some tiny kernel of truth. Imagine my disbelief though, when I hear of one of our own catching a whale. Of course, it was instantly written off as a captain making fun of my naivety. Though with every other person involved who I talk to, I’ve come to realize it wasn’t so much of a joke. Finally getting the chance to fish, I threw myself into the act. We started with mooching for King Salmon and I was immediately glad that I was on a boat full of novice anglers. The captain and deckhand each grabbed a rod and gave us a quick run through on how to hold it, how to cast, and what we were looking for in noticing a bite on the line. I’d been fishing and I knew how to cast, but casting with this type of rod is very different than the light bass pole I knew so well. I just recently went out on my first full-length fishing expedition on the open water of the Pacific, courtesy of Alaska Premier Charters, Inc. Of course, it was worrisome for me considering I tend to over think the large sea dwelling creatures below me and get very paranoid about deep water in general. It also doesn’t help that seasickness is probably my second worst fear. But fortunately for me, my sheer excitement was overpowering enough to push those fears to a dark corner of my mind. Everyone was just humming with excitement, practically vibrating as they stepped on the boat at the dock. 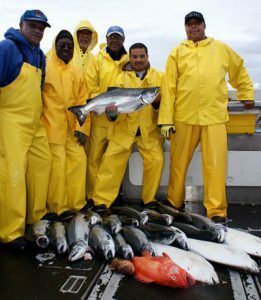 As a world-renowned Alaskan fishing lodge, Alaska Premier Charters, Inc. and the Wild Strawberry Lodge specialize in salmon and halibut, but not exclusively. Although they are prevalent, I’ve also become accustomed to finding surprising catch in the processing room. After having read Twenty Thousand Leagues Under the Sea, and spending way too much time watching ocean life documentaries, I have both been terrified and impressed with the Giant Pacific Octopus and on the 26th of May, the catch from my imagination came to life. I just so happened to already be in the processing room when a deckhand strolled in, completely itching to share the contents of his bucket with the processing crew. The tree overhanging the processing room is always burdened by ravens and eagles that sit overlooking the harbor. I find myself watching them every time I pass a window on that side of the lodge; for someone who’d never seen one before arriving in Alaska, they are really interesting creatures. Our first fishing trip of the season came back in yesterday, meaning I finally caught sight of a gorgeous salmon. Up to that point, my prior experience with fish was pointing through the grocer’s window at a random steak, generally having no idea what I was ordering or what set it apart from a goldfish fillet. Let’s just say that my behind-the-scenes fishing knowledge is lacking, but I plan on changing that while I work for Alaska Premier Charters, Inc. 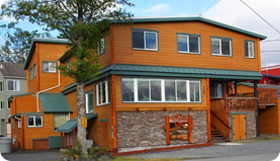 The Wild Strawberry Lodge and Alaska Premier Charters (APC) in Sitka is humming with preparations for the start of the 2012 fishing season. With barely a week before the first guests start arriving, the staff is putting finishing touches on many facets of the true Alaskan fishing lodge experience. Ina Mae and I were invited to go fishing yesterday. The day started bright and early at 4:45 a.m. I rolled out of bed, grabbed my camera and went to the rain gear room to find some rain gear my size. I quickly grabbed a pair of bibs and some size 9 mud boots off the shelf. I was ready for the fishing trip! I met Ina Mae at the breakfast line and she enjoyed some delicious crepes, bacon and eggs, fruit, oatmeal, toast and orange juice. I only had oatmeal and eggs because I did not want the "Helminen Curse" (of seasickness) to get me. It's a wonderful day here at Alaska Premier Charters, Inc. and the boats are out fishing for the day. We are excited to hear about their adventures at dinner this evening. The wildlife has been quite active lately, which makes for an even better fishing experience! 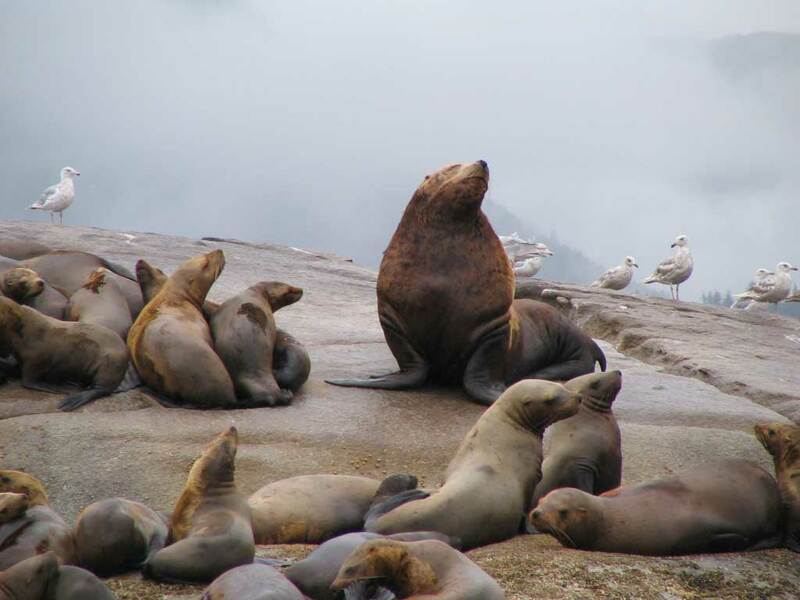 A few days ago on one of our vessels called the "IT'L'DO", we had a sea lion that attempted to steal a king salmon. The sea lion ripped the head off the fish, and our deckhand Dave managed to net the headless salmon. The fish head was reeled in still attached to the line! Lending a hand to a great cause! 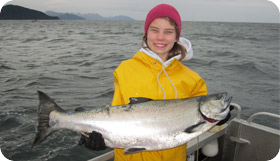 Big Brothers Big Sisters successful fishing event sponsored by the Sitka Charterboat Association. 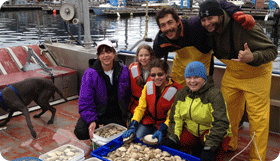 This year members of the Sitka Charterboat Operators Association (SCBOA) volunteered seven vessels to take the Big Brothers Big Sisters (BBBS) out for an annual fishing day. This year was another successful event. At 12:30 pm on Sunday SCBOA and BBBS met at Crescent Harbor at Charter Row for a group photo and a quick briefing. The Kids Don't Float Alaska Program provided life jackets for the kids 12 and under. Theresa is President of SCBOA and coordinates this annual event with James Diffin, BBBS Sitka Community Director. 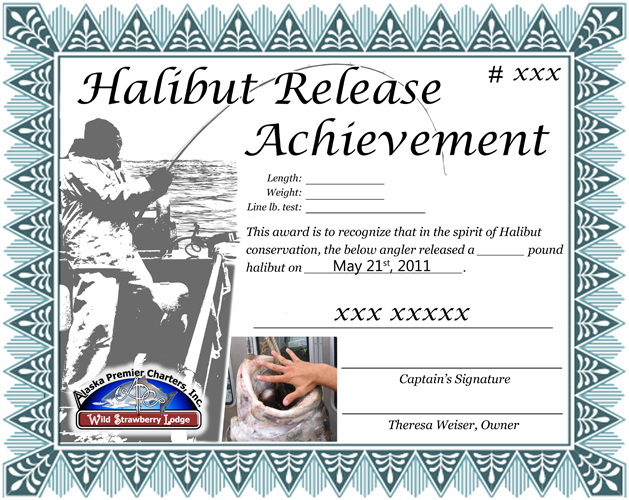 For 2011 we have a new awards program going on all summer long here at Alaska Premier Charters, Inc. There are new regulations preventing guided anglers in Southeast Alaska from retaining any halibut over 37 inches on charter fishing trips. 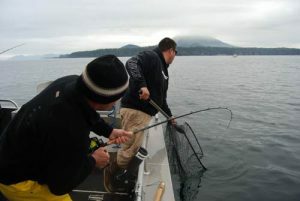 We don't want this to dampen your spirits while fishing on the great Pacific Ocean during your stay with us. To recognize the anglers who do hook large halibut, we have a new program for those who release 100 pound plus size halibut. It's that time of year when we order our bait for the new fishing season. We recently received our shipment of herring – 200 cases of tray pack herring on five pallets came in on the barge from Washington. Since we don't have room in our freezers at the lodge, we rent freezer space at the city cold storage. Whew! What a big job! Recently I had a hand in helping Theresa prepare our boats' paperwork for the 2011 fishing season. It involved updating three-ring binders filled with documents that are required by law to be kept on each boat at all times for charter fishing trips. Some of the fishing crew here at Wild Strawberry Lodge went out on the ocean for the first fishing trip of 2011 today. 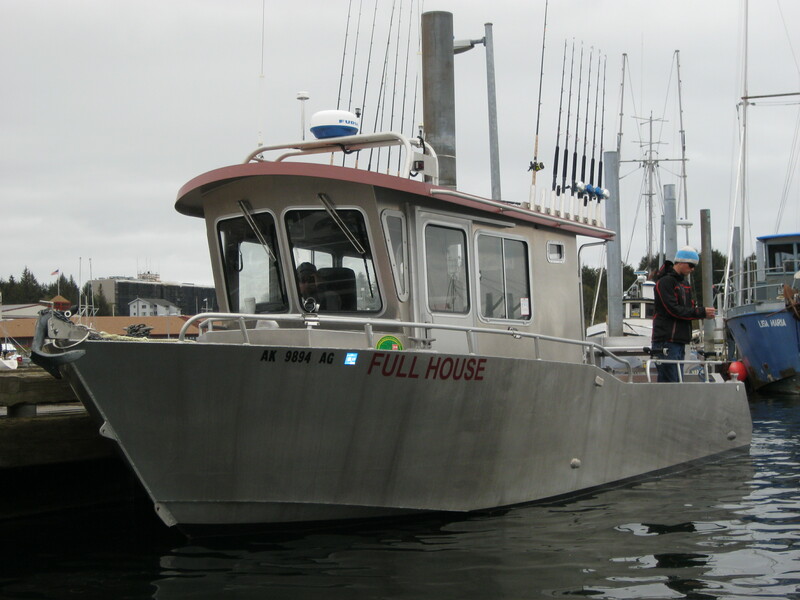 They were all excited to go catch some salmon and halibut at five-thirty this morning and all pitched in preparing the Full House for a day on the water. New season, same great service! 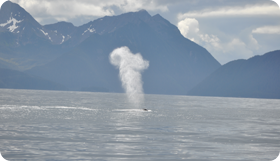 It's the start of our 22nd season here at Alaska Premier Charters, Inc. The staff arrives in small bursts, and those who are here are bustling around to prepare the lodge for the season. Vehicles are being fine-tuned, rooms are being detailed and prepped for the summer, and the captains are arriving and inspecting their boats for the water. On behalf of the Buie Party, I want to take this opportunity to say THANK YOU! We truly had a blast….Arthur and Jess had been after the rest of us to plan a fishing trip for at least 5 years! I don't know why we waited so long to take the plunge. WE all had a TRULY memorable experience. Captain John is TOP KNOTCH, he and his First Mate "Big Mike" were professional, knowledgeable and left no fish un-filleted. There are only three days left to save significant money on airfare to Alaska during Alaska Airlines' PFD Airfare Sale! It's early September, and our fishing season is winding down now. The entire staff has worked hard the past four months and deserved a little break and some recognition for everything they have contributed to the team over the summer. So Tuesday night we were treated to a staff party with food and drinks, music, gifts, games, and prizes. Lunch out on the boat, on a typical fishing day, is not usually the main focus of the day. Especially when a hot bite is on, the last thing anybody wants to do is stop for something to eat. And sometimes, during a slow time when lunch is served, it is quickly forgotten as a king salmon zings a line out or a halibut starts tugging ferociously. But whether or not the anglers on the boat make time for eating, the boat lunch is always there and ready. 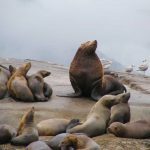 When I first got hired at Alaska Premier Charters, Inc. as the head processor I didn't know what to expect or how it would go. When I arrived it was a totally different world than cutting grass on a golf course. The first day of work was a whirlwind. The head processing job entailed many different responsibilities, all new to me. We had another big arrival yesterday and a big departure this morning. Arrivals and departures are very important to us, because we know that first and last impressions are what people tend to remember the most. So we try to take care to make sure that everything goes as smoothly as possible for you at the airport. Fishing is a delicate business. There are unseen forces at work, paying attention to the care and respect you devote to the ocean, the boat, the gear, and the sport overall. So it's important to adhere to special rules and follow specific routines to ensure the best possible catch, every single day. Sometimes when fishing, you don't get exactly what you bargained for. That's part of the fun – and frustration – of fishing! It's what keeps it from getting boring and predictable, especially when you are fishing in the great wide ocean. You never absolutely KNOW what is going to happen. I always know I've had a great trip when I return home happily exhausted, missing my vacation friends and family and, of course, despising my first week, "back in the grind." Just returning from Sitka, Alaska, I knew I'd just had a perfect vacation. A perfect vacation always includes excellent fishing. There is no question that our main focus here is on fishing. But there is a lot that happens on the beach during the day, while the boats are out on the water. Sitka, Alaska — It's 4:25 a.m. and the sun is rising over the mountains. I'm wide awake, excited about my upcoming day; I've been up for almost an hour already in anticipation. I've heard all about the World Class Fishing in Sitka—now I'm about to find out for myself why it's so thrilling. Every once in awhile, something so spectacular happens out on the fishing grounds that it is the buzz of the lodge for the rest of the season. Usually the event revolves around big fish. 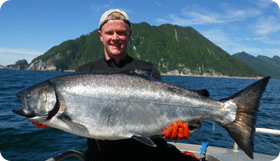 The 60 pound king salmon caught on June 18 was one such exciting story. Just under a month later, on July 16, the talk switched over to the humongous 404 pound halibut caught on the Triple Play. Fishing. It's what brings us all together, how we meet new people, and renew old friendships. Every group of clients we have here is different. 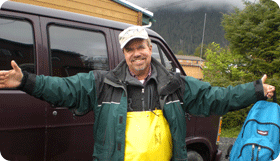 Some are long-time anglers and have been coming to Alaska fishing for twenty years. They know all the ins and outs of mooching for salmon and soaking for halibut. They bounce out of bed at 4:30 a.m., ready to go, eat a hearty breakfast, and never get seasick. They can handle any weather conditions, so long as they are out on the boat with a rod in their hands. Friday was rainy and cool, and we wondered if our fourth of July fireworks might once again be postponed. But things cleared up as evening approached, and although everything was wet, the sky was clear and the night was calm, so the fireworks continued as scheduled. The fourth of July has come and gone, and, like all over the U.S., Sitka celebrated our nation's independence. Unfortunately, the weather wasn't cooperating for the three-day celebration. It was cold, wet and rainy, but it didn't hamper anyone's enthusiasm. The whole town had a carnival atmosphere. 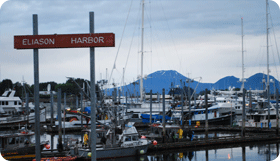 Halibut are another exciting fish to catch in Sitka, Alaska. Of all flat fish, halibut are the largest, averaging about 25 to 35 pounds, but growing up to over 400 pounds. They are typically found on the bottom of the ocean in depths from 50 feet to over 600 feet. Many people who fish at our lodge for the first time have never "mooched" before, for salmon. "Mooching," (not to be confused with smooching), is a style of fishing developed by the Japanese in Seattle's Elliott Bay in the 1920's. In essence, the purpose of mooching is to get the bait (a cut plug herring) down to the salmon, using a natural presentation. "I was reeling up my line, and at 10 feet below the surface, I got a bite. Something took the bait straight out from the boat, and I wondered if a sea lion had gotten a hold of it, line was peeling out so fast. Then it breached, and I saw this monster king salmon soar through the air. I didn't have time to think too much about it, because it dove down to 190 feet in a matter of seconds. From then on, it was a long furious fight, going around the boat three times before finally getting it back to the surface. It took about 45 minutes to land it…" ~ Franz, who caught a 60 lb. king salmon on June 18, 2010. I like taking pictures. The problem is, as a deckhand I rarely have time to pull out my camera while on the boat. I'm usually very busy, making sure our clients are having a good day on the water, including keeping their baits fresh, and serving up cookies. Not only that, when there is a chance for a photo, my hands are often covered in fish slime and I don't want to mess up my camera. So I end up taking a picture in my head, enjoying the moment for what it is. That's usually the best I can do. "Big Brothers Big Sisters of Alaska strengthens our communities by providing mentors to all children who need and want a caring adult role model – special friends who can help them expand their horizons, realize their potential and enrich their futures – changing their lives." The Sitka Charterboat Operators Association sponsored another Big Brothers Big Sisters fishing event this year. This is an annual event, usually held in late May or early June, that allows for a free day of fishing adventure for children. Recently, while motoring north through the inside passage, we witnessed our first brown bear of the season. Our captains keep in radio contact all day long, and when one of them sees something interesting, they usually pass it on to the others. Our boat had already passed the bear without noticing it, when Mike White (captain of the "It'l Do") saw it on the eastern shore and radioed over to us. We turned around to take a look. I didn't spot it right away, as it blended in well with the forest background. Then I noticed a large brown shape move through the grass of the small meadow, well over 200 feet away. At that distance, it was hard to judge how big it was, but it appeared to be a good-sized bear. 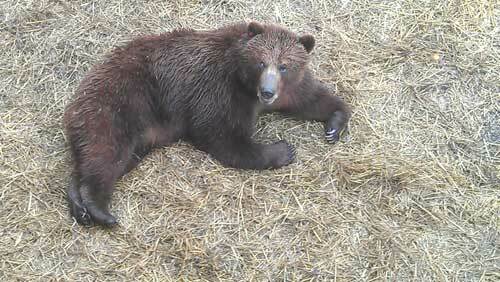 The bear was tolerant of our presence, so we were able to take some photos. "Big Brothers Big Sisters is the oldest, largest and most effective youth mentoring organization in the United States. They have been the leader in one-to-one youth service for more than a century, developing positive relationships that have a direct and lasting impact on the lives of young people. Big Brothers Big Sisters mentors children, ages 6 through 18, in communities across the county, including Sitka." ~ Exerpted from Big Brothers Big Sisters website at www.bbbs.org. Typical weather out on the ocean is a mix of sunshine, clouds, maybe a few sprinkles, and a breeze blowing the ocean into a mild chop. From what I've seen (I'm in my 2nd season), the days are predominantly sunny, though rain can appear on any given day. The day may start off in a certain way—perhaps it's rainy and gloomy on the docks when we load up at 5:30 a.m., but by the time we motor around to the far side of Kruzoff Island, it can be completely different. I think the marine environment is the major factor in this; clouds and weather systems seem to pass by quickly. Out on the open ocean, I can see for many miles around, and can often see signs that the weather is going to change long before it does. I like it when families with young kids come fishing with us. It brings back the excitement of fishing to see their eyes light up in awe, no matter what size or kind of fish they catch. The other day we took a family of four out for a half day of fishing. The two kids were aged five and six, and although excited about their upcoming day, it wasn't too long before they fell asleep. It was an early wake-up call to make the 5:30 a.m. departure. Their heads slowly sank down into their chests and their bodies crumpled until they were both draped over the boat seat cushions like wet noodles. Kids are cool, the way they can sleep in almost any position. Summer has come to Sitka, at least for the time being. The last few days have been beautiful, bright, and sunny, with highs in the 70's. Shorts and t-shirt weather, even out on the ocean! It feels HOT, compared to our usual marine temperate weather with highs in the upper 50's. We're not that used to these temperatures, and it has been the topic of almost every conversation. A lot of the staff have been taking advantage of Sitka's natural charms lately. It seems like every day, somebody else is talking about their plans for hiking, kayaking, or biking. Any time off is appreciated and enjoyed to the fullest, as all of us know that when the season really gets going, we won't have the luxury of time or energy to explore Sitka. We took on a major project this week: replacing the old, well used lodge carpeting with a fresh, new layer of carpet. Theresa had been talking to a local carpet contractor, evaluating styles, colors and designs for the new carpeting she wanted to install. She also coordinated the perfect time for the contractor to do his work—a three day window without any clients staying at the lodge. 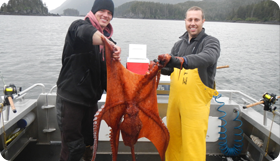 Good news on the fishing front here in Sitka. 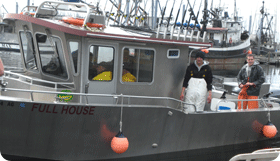 Our boats have been bringing in a lot of very nice fish the past few days. There have been some full coolers hauled onto the dock and up to the processing room full of ocean bright king salmon (which have been showing good numbers this spring), halibut (including some over 100 pounds), some large canary rockfish, yellow eye rockfish and ling cod. Ling cod season is officially open until June 15th. Non-residents can catch and retain ling cod in the slot limit of 30-35 inches. You can also go for a trophy fish of 55 inches and up. It's nice that you have an opportunity to retain really big ling cod and try to beat the world record, but it would take a massive fish. The current record weight of trophy-caught ling cod is 81 lbs. 6 oz. We welcomed our first clients of the year last week! 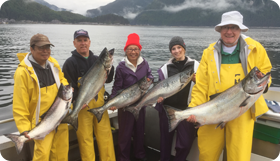 They were long-time clients, returning for their 10th annual Alaskan fishing trip. It was good to see clients in the lodge once again, making us feel like all our hard work getting everything ready for the season was justified. The guys had some good fishing days, catching king salmon, some hefty halibut, yellow eye and other rockfish, and even a few sole. They were able to help us get our "Catch of the Day" started, where we feature a new picture on the home page every day! One of our captains has recently been helping out a Sitka wildlife tour operator by giving joint tours on one of our boats. 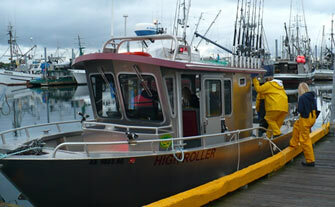 It's not uncommon for the various charter boat operators here in Sitka to help one another out if problems arise. In this case, the wildlife tour company's boat was in the shop getting a new engine, so they called Theresa, and she sent Captain EJ and the "Checkmate" to help them out. Our 21st season has started here at Alaska Premier Charters, Inc. There is a lot of work to be done getting the lodge and the boats ready for our first clients. The summer staff has started to arrive in bunches, and soon we will have a full crew of hard working staff, all preparing for the upcoming months. The captains and deckhands are working toward getting the boats ready, and the lodge staff (a.k.a. beach crew) have already gotten started organizing, cleaning, and fine tuning the lodge.